Summertime is almost here, and if your family is like mine, one of the parts we look forward to the most is all the fresh, delicious fruit we can get this time of year! 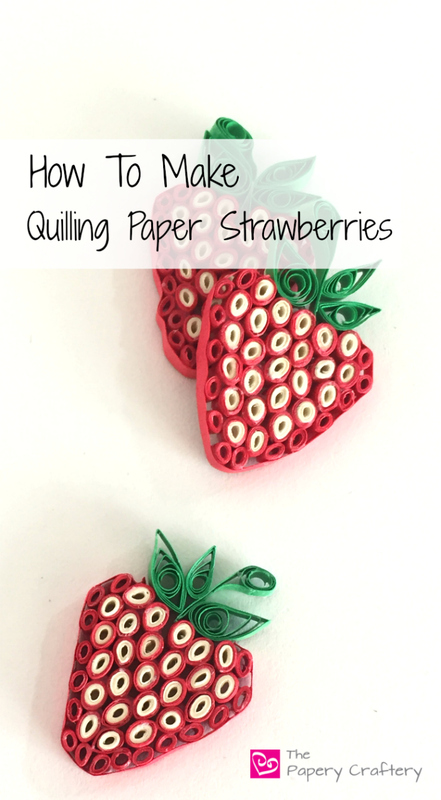 My kids love berries, and since they’re always on my grocery list and in my fridge right now, I was inspired to make a tutorial on how to make quilling paper strawberries! I first quilled a strawberry as part of a custom ordered cupcake a few years back, and last summer, I was asked to make a few to use as scrapbooking embellishments after a quilling class that I instructed for a local club. I’m including a template for the first time on this blog. Since these strawberry templates are hand-drawn, there are teeny differences in each. You can print it and use them all, or cut out your favorites and just use those as a guide. Simply place the printed template under a sheet of waxed paper on a piece of cork board and get to work. You could even enlarge them to quill bigger strawberries, since these will measure less than 2 inches when finished. Enjoy! To start with, make a few leaves for your berries. I like to make mine in various sizes for a little visual interest. For this size berry, use two 3 1/2″ strips of bright green quilling paper, and one 2 1/2″ strip. Simply make loose coils and pinch each into teardrops or marquise. The stem is formed from the same shade of green. Starting with a 3″ strip, roll a tight coil about halfway down the length of the strip. Remove your quilling tool, and let the coil go slightly. Add a small dot of glue between the coil and the rest of the strip, and pinch lightly to dry. To finish the 3-D effect for the stem, glue a small piece of green paper from coil to end of strip. Once the leaves and stem have dried, use them how ever you’d like to assemble the top of the berry. As you can see, I only use the template as a loose guide. Sometimes, the leaves don’t exactly match. No big deal! The next step to quilling these strawberries is to roll a whole bunch of seeds. Using 1″ strips of ivory paper, roll tight coils. Once the ivory coils are dry, wrap each with 1 1/2″ strips of red paper. Pinch each into a teardrop shape. Each berry needs about 25 seeds. Place the seeds on the template under the leaves and stem in a varying pattern. Once all the seeds are on the berry, make between 14-16 pinched coils from 1″ red paper, exactly like the ivory seeds. I’ve found that be adding the red around the outside edges aids in the 3-dimensional effect of the strawberries. With a little glue, attach the red teardrops around the edges of the seeds on the berries. Wrap the entire outside of the strawberry with a single strip of red quilling paper for a finished look, gluing as you go. And that’s it! Once the berries are dry, remove from the waxed paper and they’re ready to be used in whatever craft project you see fit! Make one or a whole bunch! Make them big or small. I’d love to hear how they turned out! Leave me a comment below! They look good enough to eat. I am going to try and make them. I love berrys too. Thanks for sharing. Thanks so much! I’m sure you can handle these berries. Let me know if you have any questions!